Ciara Doyle of Scariff Community College, who scored a total of 4-9, in action against Emily Duggan of Claregalway Community College during their All-Ireland junior semi-final at Whitegate. Photograph by John Kelly. 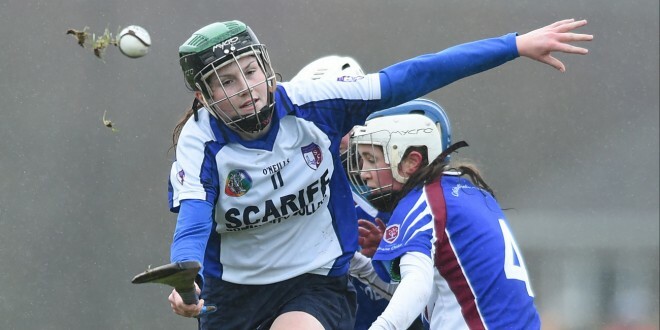 Scariff Community College proved much too strong for Claregalway Community College in the All-Ireland junior C camogie championship semi-final played at Whitegate this Saturday afternoon. 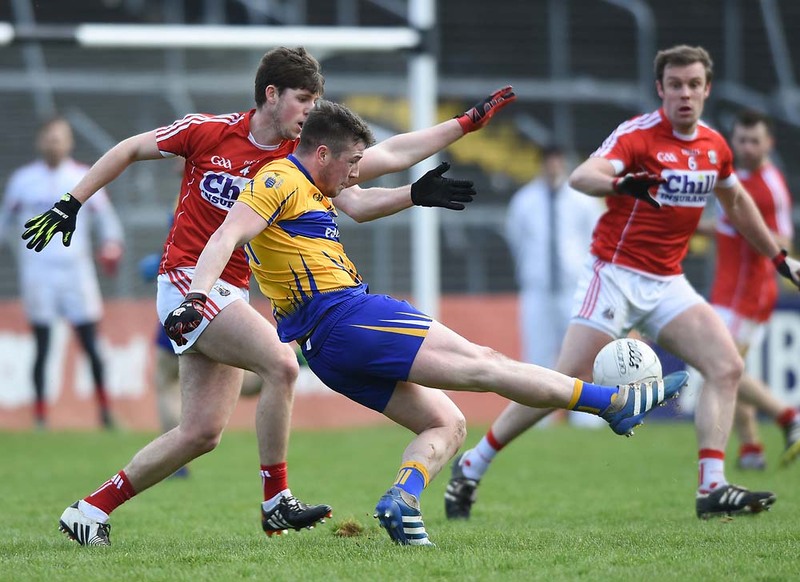 In very difficult weather conditions, the East Clare side dominated from the outset and had two goals registered inside the opening two minutes. Centre forward Ciara Doyle was in sparkling form for the winners and finished the game with a tally of 4-9, 2-4 coming in the opening half. It was 3-7 to 0-0 at the interval, the winner’s third goal coming from full forward Aoife O’Brien. In fairness to the Connacht champions, it must be pointed out that they had a quarter final tie just forty eight hours earlier and this, clearly, had taken its toll. Three points in as many minutes at the start of the second half from Ciara Doyle killed off any slim hopes of a fight back by the Galway school. Doyle, Aoife O’Brien and substitute Claire McNamara were the winner’s second half goal scorers on a day when Amy Barrett, Roisin McMahon, Alannah Moloney and Doyle stood out. Subs; Aoibheann O’Gorman (Scariff)-Ogonnelloe) for O’Callaghan; Claire McNamara (Killanena) 1-1 for Maloney; Jennifer O’Meara (Killanena) for Nolan; Aisling Corry (Scariff-Ogonnelloe) for Quigley.